❤【HIGH MATERIAL】: Durable TPU material, brings a comfortable experience when you exercise sweat, sleep , OLED display screen with touch button control, waterproof and dustproof design under the degree of IP67,The fine craft make the band easy to take on & off by Stainless Steel Metal Buckle. ❤【SLEEP MONITOR】 : Synchronize your sleep time every night and analyze your sleep quality by the sleep trend graphs; Accurately monitor total effective sleeping time and motions every night, you can better understand your sleeping quality. 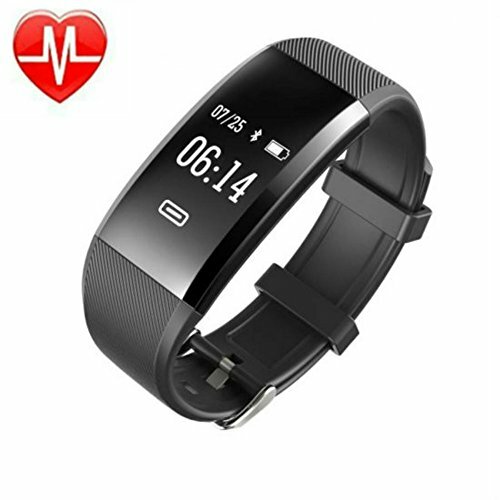 ❤【MULTI FUNCTIONS】:Pedometer, Calories, Distance, Heart Rate Monitor,SPO2(Blood Oxygen), Blood pressure ,Sleep quality measurement, Call reminder, Alarm clock, Stopwatch, Search bracelet and so on, these amazing features are available, do not hesitate; App is more comprehensive, now it is updated version. Besides, it is with high quality comfortable and fashion strap. ❤【COMPATIBILITY WITH】:The app supports most smart phones with Bluetooth 4.0. Support system: iOS 8.0 or above (iPhone SE, iPhone 5/5S/5C, iPhone 6/6S plus, iPhone 7/7S plus, etc. ), Android 4.4 or above (Samsung Galaxy S8, S7/S7 Edge, etc ). ❤【FASHION GIFT】: It is a nice sport watch for men and women and fashion gift for kids. This product is measurements are just for reference only , and not for any medical purpose basis. we are pleasure to provide you with a healthy lifestyle.